El Gordo de Navidad 22nd of December – Play Online! Christmas is the time to be with family and friends. So what if you try your luck this Christmas to see where you are going. The Spanish Christmas Lottery has the largest prize money in store. With this raffle one can easily become a billionaire in few minutes. It is one of the widely participated lottery events where more than 90 % population takes part. What is even more exciting now is that you can be anywhere you want to be and still try your luck in the spanish el gordo Christmas lottery. Spanish Christmas lottery has gone online and one can easily play it from anywhere in the world. The el gordo prize money is about 2.4 billion Euros and is by far the largest lottery in the world. It started during the Spanish civil war and is the longest running raffle event. There are many categories of prizes with El Gordo being the first spanish Christmas lottery jackpot prize. Buy Spanish Christmas Lottery Tickets Online! A fast and secure no nonsense way to get your lottery tickets. Play Now and receive a $30 CashBack promotion with your first purchase! %100 Genuine Official Scanned Tickets in Your Account. How does the el gordo lottery work? 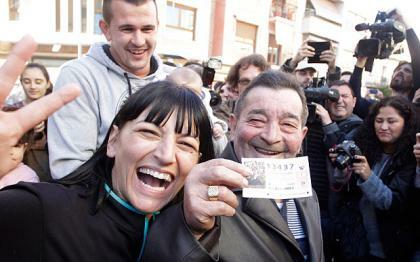 The Spanish Christmas lottery gives the highest number of winners and with instant millionaires. The lottery has a specific set of 5 numbers in the ticket printed to ensure the winner and these numbers are unique for each ticket. There are two drums to determine the winning number and the el gordo prize money associated with it. The lottery is held each year and has been quite popularized throughout the world. With the new online spanish el gordo Christmas lottery services anyone can avoid the long queues and the rush to get the tickets. You can even play on the day when you think you might turn out to be lucky. The Spanish lottery can be shared with friends and families and this increases the chances of winning even. So in the holiday season you can get together with your near and dear ones and try out their multiple decimos (1/10) shares! So wherever you are, buy the tickets online and start playing!